No matter where you are, manage your funds with our online banking and bill pay. Monitor the day-to-day activities of your business and your financial resources with our Business Online Banking service. You’ll have access to your accounts from the convenience of your office with complete security 24 hours a day, 7 days a week. Welcome to Severn Bank’s new Business Online Banking System. If you have not yet made the switch or signed up for new Business Online Banking contact our Solution Center today at 1-800-435-4184. View our Personal Banking Tutorials to get helpful assistance with many of the features offered at Severn Bank. 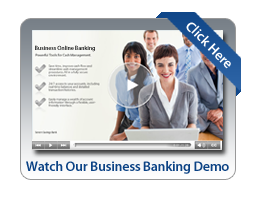 Watch our Business Banking Video Tutorials to learn more about the Business Banking offerings at Severn Bank.